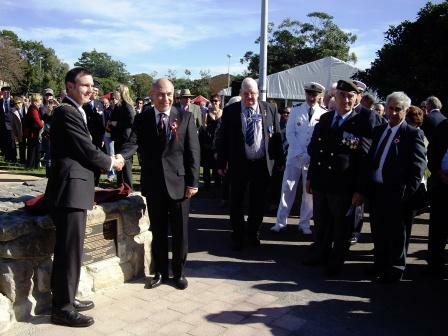 On Saturday 28 June the French community in Australia commemorated the contributions of Australian soldiers in France in World War I with the unveiling of a plaque at Memorial Park at Matraville, a suburb of Sydney. Just a few weeks before the 92nd anniversary of the Battle of Fromelles on 19 July, 1916, when Australian troops first fought on the Western Front and with the commemoration of 90th anniversary of the Armistice to end the Great World War in November, the commemorations focused on those soldiers who had left their homes in Australia when duty called, had survived the war and returned to Australia. Photo: Mayor of Randwick, Councillor Bruce Notley-Smith and the Consul General of France, Monsieur Lionel Majeste-Larrouy unveil the plaque commemorating the 90th anniversary of the Armistice ending World War 1 and celebrating the close bond between the peoples of France and Australia. Following The Great War some of the returning Australian soldiers were able to move to houses in a special “soldier settlement” at Matraville where the land was provided by the New South Wales Government. The houses were built with volunteer labour organised through the Voluntary Workers Association and with construction material provided by charities and business in appreciation of the soldier’s contributions during the Great War. 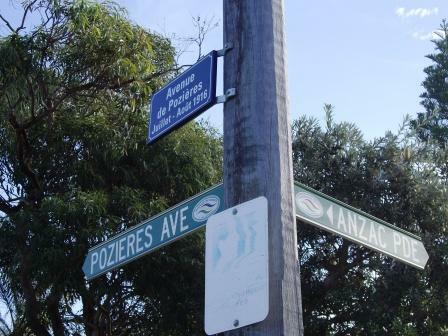 The Matraville Soldiers’ Settlement is on the western side of Anzac Parade, named in honour of the soldiers of the Australian Imperial Force, who marched along the road from their barracks at Kensington racecourse to Sydney Harbour where they boarded transport ships to Egypt, Gallipoli and the Western Front. 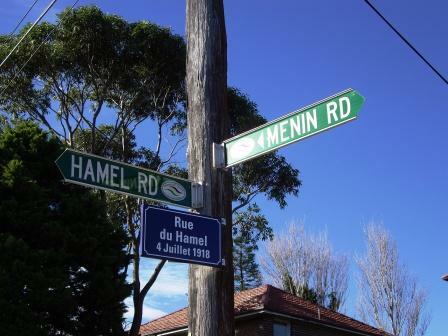 The Matraville Soldiers’ Settlement consisted of 93 homes for servicemen and the streets were given names after sites of significance to the “Diggers”, including Lone Pine from Gallipoli and Romani from Palestine, with the majority of streets related to the Western Front: Menin Road, Messines Place, Armentieres Way, Amiens Way, Somme Way, Pozieres Avenue, Flers Way, Bapaume Parade, Bullecourt Way, Beaumetz Way and Hamel Way. The commemorations commenced with a welcome from the traditional owners of the land, who could relate to the period before European settlement. Speeches were given by the Mayor of Randwick, Councillor Bruce Notley-Smith; the Consul General of France, Monsieur Lionel Majeste-Larrouy; Delegue General du Souvenir Francais pour la Nouvelle Caledonie (General Delegate of Remembrance for French New Caledonia), Monsieur Dominique David; President of the Association Francaise de Anciens Combattants de Nouvelle-Galles-du-sud (French Veterans Association of New South Wales), Theodore Arafas; as well as the New South Wales President of the RSL (Returned Servicemen’s League), Don Rowe O.A.M. The commemorations fortuitously coincided with the visit to Sydney of the French frigate Prairial and some of its company of officers and men were able to attend, accompanied by its commanding officer, Commander Rouviere and the Commander of the French Navy in New Caledonia. 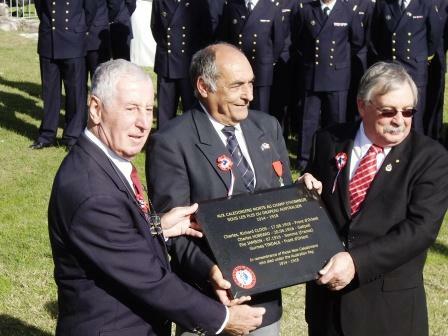 Flag bearers of the French Veterans Association of New South Wales, who participate in Remembrance Day services at the Sydney Cenotaph each year, represented the French community in Australia. 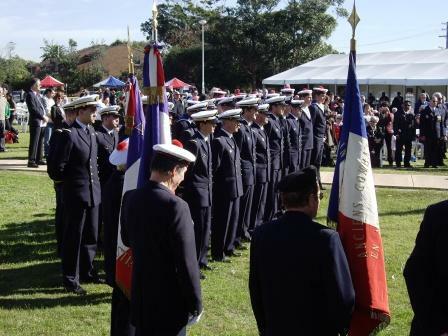 Photo: Flag bearers of the French Veterans Association of New South Wales (Association Francaise de Anciens Combattants de Nouvelle-Galles-du-sud) and officers and men of the French frigate Prairial. 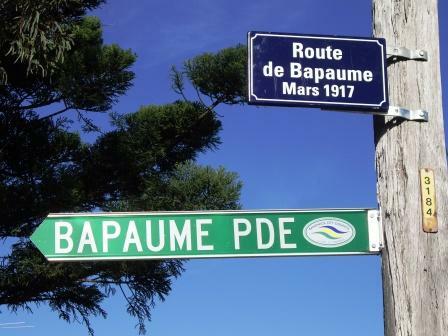 A special gift of street plaques, in the style used in Paris, bearing the names of the streets with major battles in France of relevance to Australian soldiers were made by the French veterans. 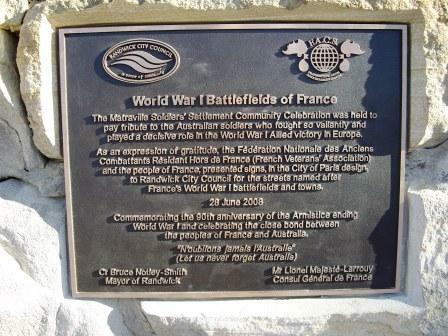 In addition, a plaque was presented to commemorate the service of 17 New Caledonians who joined the Australian Imperial Force and the sacrifice of 4 New Caledonians who died during World War I under the Australian flag. 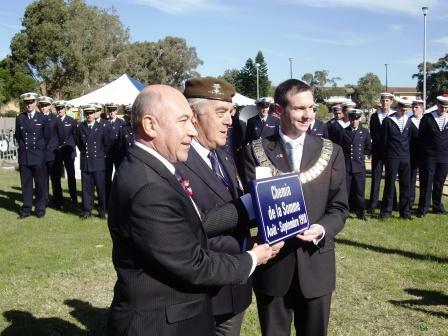 Photo: The Consul General of France, Monsieur Lionel Majeste-Larrouy and the President of the Association Francaise de Anciens Combattants de Nouvelle-Galles-du-sud), Theodore Arafas present the street plaques in the Parisian style to Mayor of Randwick, Councillor, Bruce Notley-Smith. 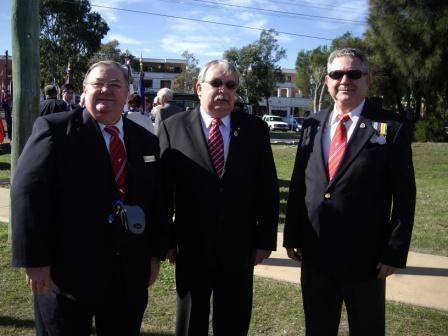 Photo: Monsieur Dominique David, Delegue General du Souvenir Francais pour la Nouvelle Caledonie and Theodore Arafas, President of the Association Francaise de Anciens Combattants de Nouvelle-Galles-du-sud), present Don Rowe O.A.M, New South Wales President of the RSL (Returned Servicemen’s League) with the plaque to commemorate the service and sacrifice of the four New Caledonians who joined the Australian Imperial Force and died during World War I under the Australian flag. The national anthems The Marseille and Advance Australia Fair were played by the band of the University of New South Wales Regiment to conclude the formalities. 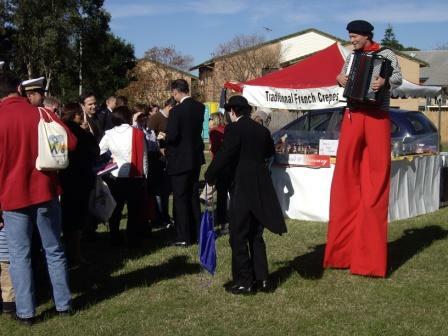 French food and entertainment followed in a village atmosphere. 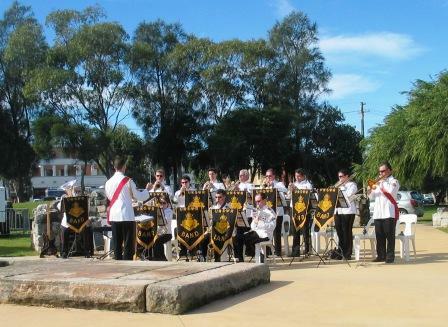 Earlier in the day, a plaque commemorating the 220th anniversary of Pérouse Expedition led by Captain Bruno de Vaisseau Juet was unveiled at La Perouse, on the northern shores of Botany Bay. The day had raised the awareness of the long and strong relationships between France and Australia and it was fitting that the evening concluded with the two friendly countries playing a rugby match. This entry was posted in Commemorations. Bookmark the permalink.